‘March Madness’ is now underway creating a buzz of excitement with brackets, rivalry and the hope that this year your alma mater will win. But for IT teams the excitement can fade fast with the annoyance and frustration caused by dealing with the inevitable slowdowns and troubleshooting that will occur when their company’s employees start checking scores and streaming the games online. Creating a strong offense and defense strategy ensures that IT teams can detect and resolve network traffic strain. This year is different from the past few years because it is easier than ever for employees to watch their big games in full-screen HD streamed to desktop computers and mobile devices connected to their work networks. 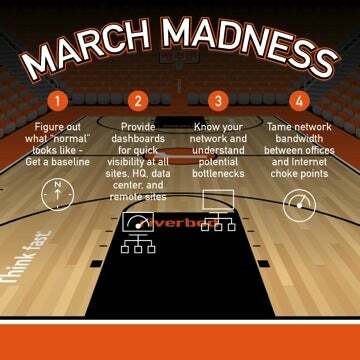 One of the reasons thanks to the recent initiative with the NCAA and Turner Sports every single game is available on any connected device, including tablets and smartphones. Figure out what ‘normal’ looks like: Get a baseline of network capacity and how to control flow to and from remote offices and other external sites. Ideally IT can use a single management console to establish the automated baseline of performance from multiple gateways across the enterprise infrastructure, including the WAN and LAN, and see exactly why performance has fallen below that baseline. Provide dashboards to remote sites: providing the appropriate business unit leader or site manager with visibility into network performance at the specific site can help IT better monitor the entire network. That person may not be part of the IT team and not as technically proficient, so the dashboard should provide a detailed, yet simple-to-understand real-time view of what application(s) may be causing lag. The distinction between work and not work is disappearing as employees check their bank statements or send emails to their doctors or family members while at work, and on the other hand answer emails and access work files when they’re at home. Saturating the company network with traffic that isn’t related to the business can affect an organization. Clearly, this isn’t just an IT issues, it’s a business issue.